It isn’t news as such, but I couldn’t allow December 17th to pass unrecorded on an aviation related blog. 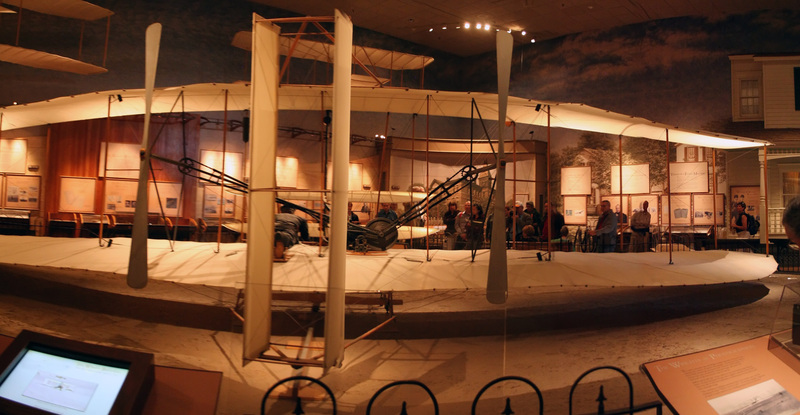 111 years ago today the Wright Brothers made their historic flight at the Kill Devil Hills, Kitty Hawk, North Carolina. I noticed that History Today published an older article on Facebook today re-stating the bizarre rival claim of Alberto Santos Dumont that he made the first powered flight 3 years later, since his 14Bis was the first aircraft to take off under its own power in 1906, the Wright Flyer having being launched. Since the Wrights’ engine must have helped sustain the earlier flight I think this is a nice but irrelevant argument. I’m happy to stay with the American claim. However, this is news. Kansas.com published an article and a picture today of the continuing restoration of the old China Lake B-29 Doc (44-69972). The article says the volunteers hope to have Doc back in the air in Spring 2015. A link to the article is in the photo caption. There are several excellent personal recollections of what individuals went through in RAF Bomber Command during the Second World War. I have read many, and would like to get hold of a few which have passed through my hands over the years. I would also be interested to hear from anyone who may have recommendations. Charlwood, Donald. No Moon Tonight. London: Angus & Robertson, 1956. Tripp, Miles. The Eighth Passenger. London: Heinemann, 1969. Yates, Harry. Luck and a Lancaster. Shrewsbury: Airlife, 1999. Don Charlwood’s and Miles Tripp’s books caused sensations when they were first published, giving a personal and very direct view of what life was like in Bomber Command at different times in the war. Yates’ book came out somewhat later, but was, and is, remarkable for a first book written at the age of 77. All of them give a personal sample of opinions and attitudes among the aircrews; the lives they lived on the squadrons, the stress of operational flying, the constant threat of death, and the simple urge to survive. With the increasing use of the Internet as a research tool many websites and blogs have arisen. One in particular that grabbed my attention was the simple but well researched and eloquent “Aircraft Q failed to return.” (http://rafww2butler.wordpress.com/) This site is dedicated to the memory of Sgt. Cecil Arthur “Butch” Butler (1913-1945), Flight Engineer on Lancaster ME334 “TL-Q” of 35 Squadron. Butler and the rest of the Johnson crew were killed on their 31st operation on 4th February, 1945 when their Lancaster was shot down on the outskirts of Bonn. The normal Bomber Command tour of duty was 30 operations (see below for a different perspective), but since 35 Squadron was part of 8 Group PFF (Pathfinder force) they would have been required to complete a tour of 45 operations. I was re-reading The Eighth Passenger recently and wondered if any more information could be found on the Web about the crew. I’d known about Miles Tripp’s career as a thriller writer from the time I started working in a Library, but I’d never seen or read his first novel (Faith is a Windsock, 1952) or had any idea of his wartime service in 218 Squadron. The Eighth Passenger had the same effect on me as it must have on so many people when it was first published in 1969, it was a fascinating, amusing, and occasionally shocking revelation. Tripp and his crew (led by Flight Lieutenant George Frederick “Dig” Klenner, DFC, RAAF) were probably the only members of 3 Group Bomber Command to complete a tour of 40 operations when the operational tour limit was briefly increased in 1944/5. Most readers of The Eighth Passenger will be familiar with this picture of the Klenner crew on completion of their last operational flight on March 11th, 1945. Klenner crew, 218 Squadron, on completing their operational tour, 11 March 1945. 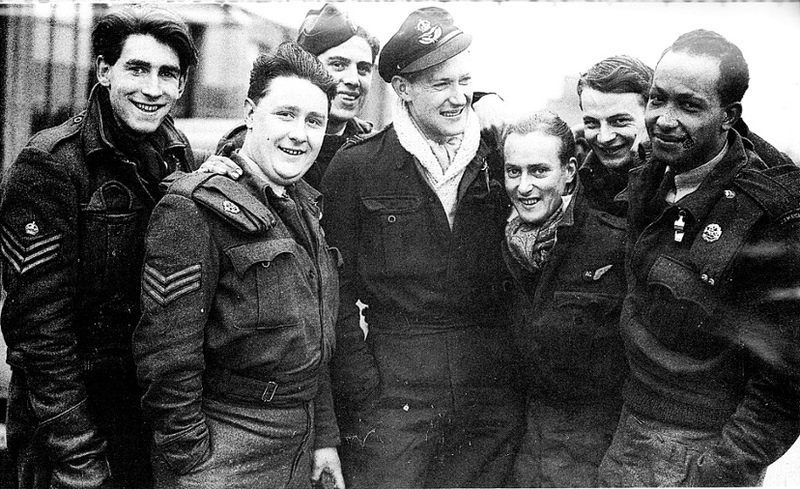 George “Dig” Klenner and crew, 218 Squadron, 11 March, 1945. I had wondered why “Mike” Tripp’s fellow crew members commented in The Eighth Passenger about his non-military hairstyle and how far ahead of its time it was. From this angle one can almost see how his hairstyle would be adopted with some enthusiasm by the mods, nearly 20 years later! Given the chance I would very much like to see this exhibition. It sounds and looks really great and it hasn’t even opened yet. I saw some footage of the Duke of Edinburgh having an early tour, (Daily Telegraph image below). Do me a favour. If you’re in the UK and you get the chance, go and see this exhibition and make me incredibly envious. N83FA / VH-INY – A Brush With Fame. Dedicated readers (of which I’m sure there is one) will have noticed a lot of posts about C-54s and Carvairs. One example in particular caught my attention. It was first known by Douglas as construction number 10365 when it was built in 1944. This aircraft had a variety of military and civilian identities before its demise in a crash in Georgia (USA) 1997. A good potted history of the aircraft can be found at http://www.aussieairliners.org/dc-4/vh-iny/vhiny.html A much more detailed history (with the exception of its service in Australia) can be found in William Patrick Dean’s nearly exhaustive book on the Carvair – see the bibliography for more details. 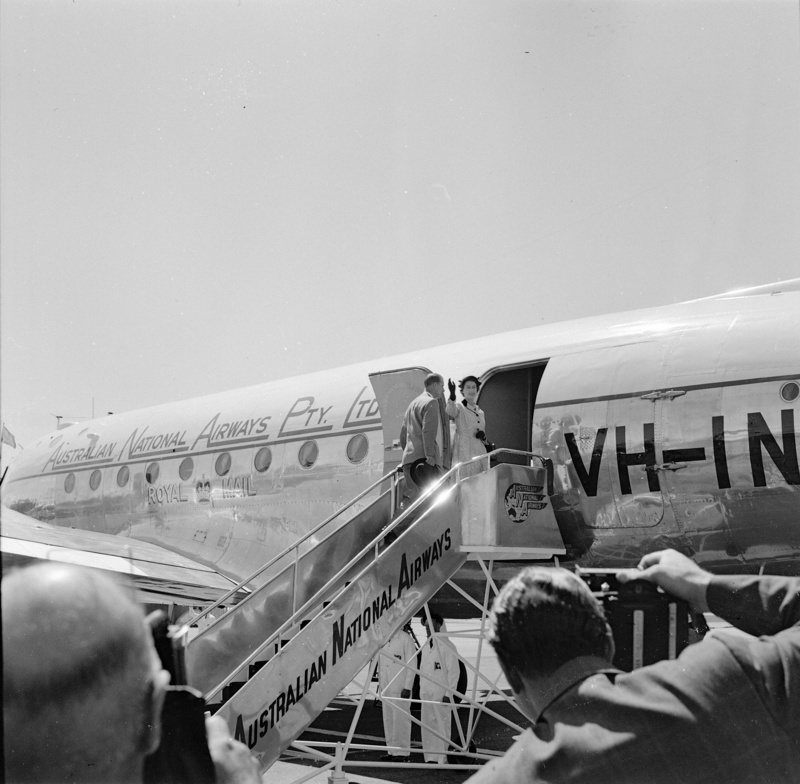 The Aussie Airliners website notes that VH-INY (as 10365 was at that time) was one of two C-54s which Australian National Airways set aside for the Royal Tour of Australia in 1954 (the other being VH-ANB). I wondered if any pictures existed of the Queen with either of the Skymasters and ‘INY in particular. Standard image searching turned up nothing. After a while I had a look on Trove, the catalogue of the National Library of Australia, and I hit the jackpot. Her Majesty visited Tasmania on February 20th, 1954, and a couple of pictures in the State Archives of Tasmania show two Skymasters which flew her and the Royal Household back to Melbourne. One of the photos shows her waving to the crowd from a very highly polished C-54 as she was leaving Western Junction in Tasmania. The aircraft registration letters VH-IN are clearly visible. – so if the other aircraft was ‘ANB then this must be ‘INY. These are the catalogue records and URLs for the other images I found. In addition to the royal connection, It is also possible that when 10365 was serving with Matson Airlines in the late 40s as N58003, she may have been flown by the American author Ernest K. Gann, who was a pilot with Matson at that time. Patrick Dean makes the point that Gann had an interesting scrape in another of their C-54s and wrote about it his autobiographical work Fate is the Hunter. So that’s interesting. I don’t suppose that anyone at Aviation Traders or indeed any of its subsequent owners or pilots had much idea that 10365 had carried British Royalty or may have been flown by a famous author. These little details make research just a little bit more personal.